Montana is filled with many minerals. One of the most intriguingly named is dogtooth calcite. Not, in fact, a fossil of actual canine teeth, “dogtooth” is actually a reference to the shape of the crystals: the golden honey-colored calcite naturally forms into very pointy pyramid shapes. At times, the crystals will double terminate, creating beautifully faceted footballs. Calcite is a soft mineral that is easily scratched with a knife. Found in more different shapes than any other mineral, calcite is sedimentary and has perfect cleavage. In addition to the desired golden honey of the dogtooth crystals, calcite also comes in clear, black, grey, white, blue, pink, brown, yellow and red. Both fluorescent and phosphorescent, calcite is also the mineral that has preserved trilobites’ detailed compound eyes for us to admire. Calcite is a wonderful mineral to start collecting or to add to an existing collection. It is as beautiful as it is fun. The added thrill of potentially finding your own piece here in Montana increases its desirability. 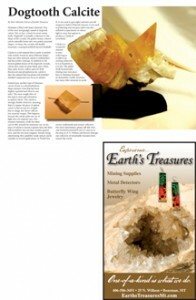 Earth’s Treasures has many other minerals to excite novice rockhounds and serious collectors. For more information, please call 406-586-3451, visit EarthsTreasuresMT.com or come in to the shop at 25 N. Willson and browse through our collection of remarkable treasures from around the world.